After Colonel Nils von Schoultz ordered the two schooners being towed by the steamer United States cut loose early on November 11, 1838, they sailed downstream under a sliver of moon. Guided by just the loom of the shoreline, the helmsmen sought the lamplights of Prescott, Upper Canada, the predetermined target of the Hunter invasion. Colonel von Schoultz pulled his senior officers together and outlined his attack plan. They would land at the Prescott harbor, unload the men and artillery, and form into three groups. 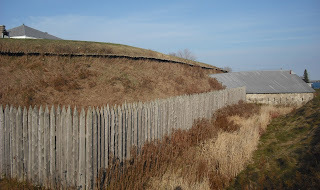 His principal objective was to capture Fort Wellington to the east of town. Von Schoultz told his men he expected little resistance. General John Ward Birge had assured him that Canadian citizens and militia would flock to the Hunters as liberators. Von Schoultz could not have been more misled. Birge and his advisors chose the most loyal county in Upper Canada to attack. Also, by then, everyone knew of Birge’s plan to confiscate Canadian land to reward American raiders. Instead of a friendly welcome, the Hunters faced the same tenacious militia that had defeated superior American armies during the War of 1812. Favorable winds blew the schooners close to Prescott. Upstream from town, the crews dropped the sails and lashed the vessels together. They drifted through the predawn mist towards Prescott. As they came upon the wharf, John Chronkhite, 29, jumped ashore and attempted to make fast the ships. Chronkhite reboarded just as the rope broke. The ships drifted across the harbor. A few militiamen, part of a 100-man contingent in Prescott, spotted the suspicious ships and fired their muskets. Frustrated in his plan, von Schoultz ordered the ships across the river to Ogdensburg. 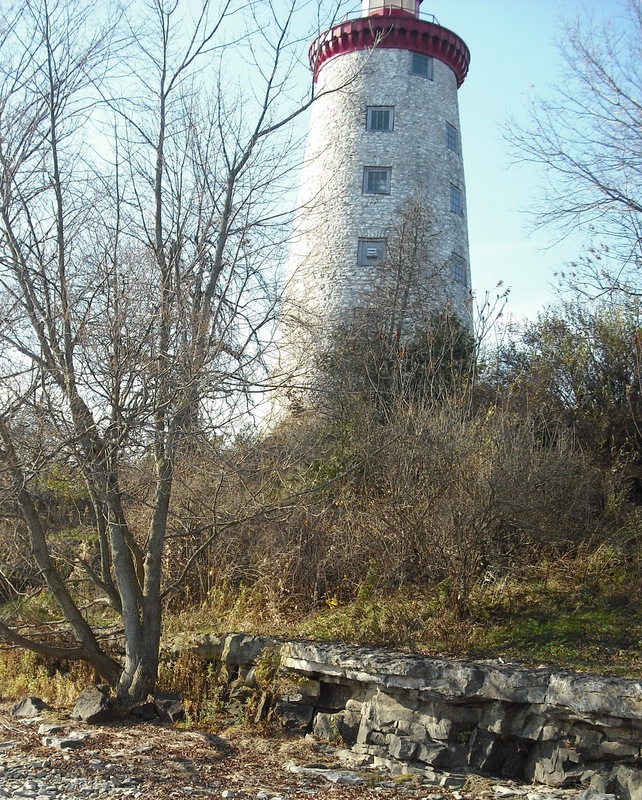 As the sun rose that cold morning of November 12, 1838, the crowds of curious residents and Hunter fighters along the Ogdensburg shore witnessed the embarrassing result of the Hunters’ aborted raid. The two hired schooner captains, unfamiliar with the local waters, had run both ships onto a mud shoal in American waters. In addition, the schooners were tangled in each other’s rigging. Bill Johnston rowed to the stranded vessels and took charge as Admiral of the Hunter navy. He quickly organized the disentanglement of the rigging. Next, he had men offload munitions from the Charlotte of Toronto onto a scow. The lightened schooner refloated and moved into deeper water. As Johnston worked his magic, General Birge visited the schooners in a hired rowboat. He declined to come aboard or speak to the senior officers. He relayed his orders to Captain Daniel Heustis: “Get the men and cannon ashore [in Canada] as quickly as possible.” In his memories, Heustis labeled Birge a coward—none of the General’s activities that bloody week gave any evidence to the contrary. Von Schoultz ordered the free schooner to cross the river to a point about one mile downstream from Prescott. Because of shallow water, the ship anchored a distance from shore. A flotilla of small boats carried the Hunter fighters to the rocky beach. Johnston followed in the scow with ammunition and two small cannon he liberated from Ogdensburg arsenals. Von Schoultz, Heustis and eight men landed first. 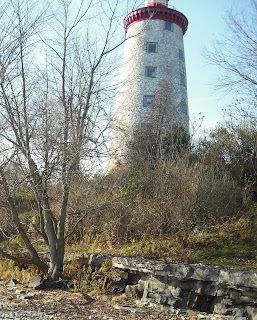 They immediately took possession of a six-story windmill, perched a few yards from the steep river bank. Next to that former flour mill sat the hamlet of Newport, a cluster of nine stone buildings and a wooden barn. The windmill became a lighthouse and is now a museum. As more men landed, the Hunters occupied the barn and most buildings, and began to fortify their tiny wedge of occupied soil. Powder and ammunition they stored in the windmill because of its four-foot stone walls. Von Schoultz commandeered a three-story tavern and store as his headquarters. Gunners set up their three cannon behind a makeshift stone wall. Snipers took positions in windows. From their high vantage points they had a clear view of the only naval battle of the Patriot War. Next installment of the Battle of the Windmill.